You read it correct, it's RM7,500 or starting from USD2,000 for basic model. 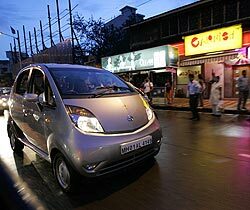 Welcome abroad Tata NANO, the world's cheapest car unveiled in India by car manufacturing giant Tata Motors. Remember those days when we see a lot of TATA lorries and buses plying our roads? The Nano was designed to let people in India who currently risk their family on scooters, motorbikes, and trishaws to be able to afford alternative mode of transportation which is safer. It was reported that Tata has 206,703 orders for the car as at launching day. Wow, that is about 4 months of Malaysia's total sales of new vehicles, note that that figure is Tata's alone. Malaysia's projected volume for 2009 is 480,000 cars compared to a total sales of 548,000 in 2008. 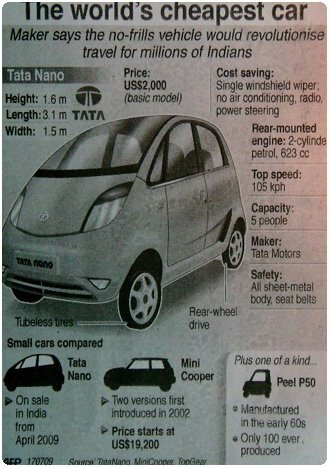 In one year, our very own Proton sold a total of barely more than half of Tata's order for a single model (Nano). Why? Because Tata makes cars inspired by need and requirement of the market. Can we say the same for Proton? If not because of "forced buying" tactic of Proton - through imposing high taxes, fees, tariff, etc. on imported vehicles - its local sales may fall well below those of Toyota's and Honda's. If Tata is too far for Proton to look upon, look no further. Perodua, without Proton knowing it, has overtaken it by selling more cars that the masses need. Did Proton take cue of that? Or, the false sense of invinsibility is still very much intact and drilled forever in the management's head?